Premium PU leather and silicone surroundings protect your iPad from scratches and bumps. Stays locked shut when on the go. Besides activating the iPad's Auto sleep-wake function to instantly wake your iPad when you open the cover and send it to sleep mode when you close it. The Bluetooth Wireless Keyboard will enter its own sleep mode after a few minutes of inactivity - simply press any key to wake the keyboard up again. Sleek, ultra-slim design makes for easy portability. Just 1.22lb weight, makes this wireless keyboard extremely portable & the perfect travel accessory. Ultra-thin and lightweight, it's portable and convenient for you to carry around and use it anywhere. Durable and wear-resistant keys' lifespan is up to 3 million times. It features responsive clicks and can ensure long-lasting use. At EC Technology, we believe in our products. That's why we back them all with an 12-month warranty and provide friendly, easy-to-reach support. 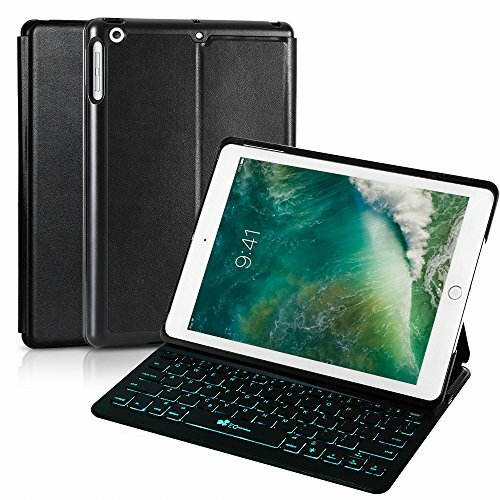 The case would NOT fit iPad Pro 9.7 / iPad Air 2 / or any other iPad models. Maxmium Protection and Auto Sleep / Wake Smart Cover: The case with high end ABS material and the the folio PU leather provides decent shock protection and prevent from scratches, collisions and dust. This iPad cover comes with Sleep / Wake function that puts your i-Pad to bed when closing screen. 7 LED backlight key colors with different brightness intensity: The iPad Air 1 Keyboard is attached to a lightweight case with a strong magnet.You can change the backlights to different colors and intensity with keys; 15 hotkeys make it easy to search, switch language, change volume on iPad, etc. Built-in rechargeable Powerful Lithium Battery: with an industry-high capacity, make the keyboard stay for up to 100 days and only needs 2 hours to be full of charge, estimated uninterrupted working time 200 hours. 3-In-1 functionality : The intelligent magetic strip allows the keybaord power on once you lock the iPad in the upright position, and it'll instantly power off when you seperate them. Magnetic switch keyboard + multi-angle stand + premium adjustable case perfect combination lets you easily adjust the viewing angle you like and ideal for working, writing, or watching videos at business, school, travel, and home. If you have any questions about this product by EC Technology, contact us by completing and submitting the form below. If you are looking for a specif part number, please include it with your message.